Why not globally ban players in question from chat only? It would make more sense. It is not like that players are in abundance anyway. I doubt that many players would be punished at once, but by banning even 5 players punishes other people by taking away their opponents. It is rather frustrating getting a match. We have that mute function anyway... people should grow up and take care for themselves not relying on Eugen to be their mother to protect them from harm that is couple of bad words. Wait, you guys are trying to moderate that? I'm the guy that says the stupid stuff! cyrogeist wrote: Wait, you guys are trying to moderate that? Re: I need some help reporting a player. This takes place in Airland Battle. At about 7:47 pm on 4/15/14, I joined a random game. I joined the last slot on NATO side because I had been horribly beaten playing as the PACT in the last game I played. 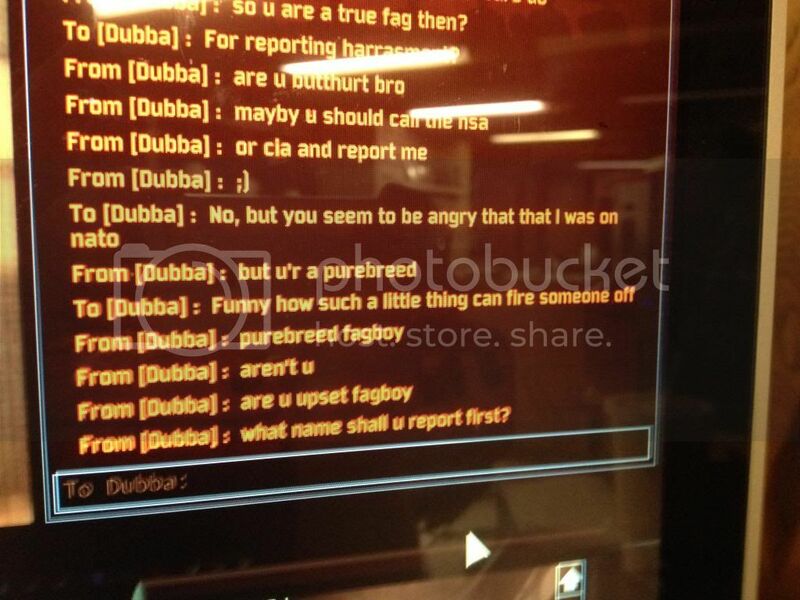 A player by the name of Dubba and one I have forgotten the name of started spamming the chat calling me a "fag" over and over again. I informed them that I didn't want to play as the PACT because of my last game, but the host just kicked me off the sever. As I looked for a new sever, Dubba started PMing me calling me a "fag" and other sexual slurs. I started looking for a way to block/report the player. I also asked him why it is wrong to be a "fag" and why he wasn't just playing his game. After about 10 minutes of searching. I figured that I had to report this to some sort of forum. I informed Dubba that is toxic behavior will be reported and hit the delete button thinking that it would stop the conversation. I deleted the first part of the toxic spam by mistake, but Dubba kept sending PMs. He eventually stopped soon afterwords. I took 2 photos with my phone and went out to fine the forum. The forum is not letting me post the images here. Sorry I could not report this earlier. Context: He kept asking for help to raid their spawn, and we were top preoccupied to help him at the time. To get our attention, he began to TK our cvs with Harriers. He got 4 or 5 before I randomly disconnected from the game. Comment: the actual TKing is around the last 2 minutes, so enjoy the game before that, it was really fun. EDIT: I have screenshots too if you need them, just ask. Comment: For my 4 arty need more ammo. And i sai to him, Then he destroyed my artillery. Please forgive me for my actions, when i bomb his units, Because I am very angry. hmm would be nice if people actually read the OP and provided necessary info instead of "waaahhh player X hurt my feelings pls ban". how are they supposed to pin down the culprits if you don't provide a server name or replay? naizarak wrote: hmm would be nice if people actually read the OP and provided necessary info instead of "waaahhh player X hurt my feelings pls ban". I have replay provided and the server was mine, a 4v4. Anything else you want? Excroat3 wrote: I have replay provided and the server was mine, a 4v4. Anything else you want? Teamkilling won't be tolerated on dedicated Wargame servers.